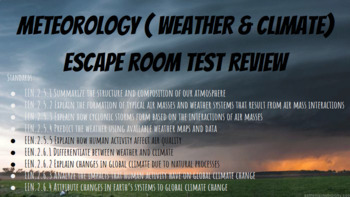 This is an escape room I use for a test review for Meteorology: Weather & Climate with my Earth & Environmental science class. This is a great way for students to review and have fun while doing it. 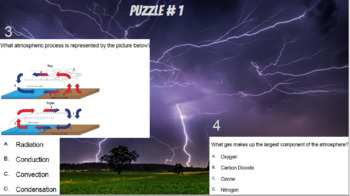 - Powerpoint (editable) & PDF format with 32 questions dealing with Meteorology: Weather & Climate. 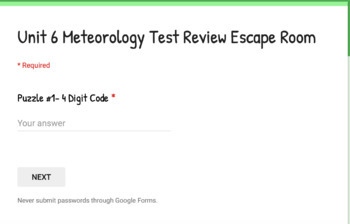 - Digit Code Lock for students response Google Form linked in the power point & PDF. 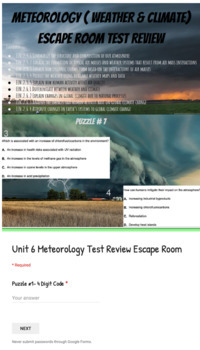 - Meteorology: Weather & Climate PDF & Document format Test & Key. -All the teacher needs to do is post the PDF on google classroom or however they want the students to get the PDF. -The students will open the PDF and read the second page and will have to click on the link which will open a google form for the escape room. - Students will look at the questions on the PDF and figure out what is the correct answer. - Once they have their answer they will put in the correct letters (ABCD) in to the google form. -Their are 8 sections that contain 4 questions, so there should be 4 answers for each puzzle lock. Write Down ( I know Meteorology & will pass the test tommorrow ) on a piece on paper and turn it in with your name! This allows you to know who made it through all the sections by getting the right answers. Please leave feedback and rate!! If you have any questions please email me and let me know!